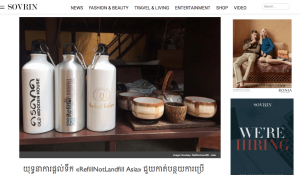 Word is spreading in the Khmer Language Communities with both Sovrin Magazine and CamNews both publishing articles about the RefillNotLandfill Campaign in March 2019! From month to month, the RefillNotLandfill campaign to reduce single use plastic bottles, continues to grow across the region – and this has mostly been achieved by word of mouth between likeminded businesses. We’re excited to see more interest from various media channels both online and printed. 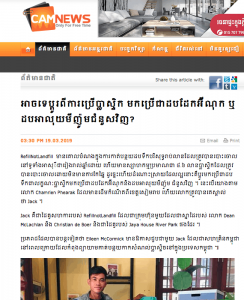 And we are MOST excited to see Cambodian language publications, picking up on the campaign and spreading it to their audiences.